On the 20th of May on the occasion of the Metropolitan Solutions, 18 high-level-guests from all over the world on invitation by the department of Foreign Affairs, visited the Fraunhofer FOKUS during a Berlin-Tour to the theme “The intelligent City – innovative solutions for the cities of tomorrow”. In her welcome address the director Prof. Dr. Schieferdecker explained that a city is smart if it functions in an energy efficient manner, is resilient against external influences like terror or bad weather, promotes electro-mobility as well as ensures transparent public and political participation. Information and communication technology plays a central role since it connects various IT systems of a city and efficiently evaluates the huge masses of data collected. FOKUS is represented in all ICT-intensive areas of the Smart City research such as eGovernment,eHealth as well as Public Safety, Smart-Mobility and Smart-Energy. Following Dr. Ulrich Meissen, head of the Competence-Centre Electronic Safety and Security Systems (ESPRI), demonstrated in the Safety Lab networked safety-solutions for citizens. He presented KATWARN a free-of-cost Smartphone App and a digital siren with voice output that is connected to the high speed broadband internet wirelessly using the WiBACK technology developed by FOKUS. The guests who partially belong to developing and emerging countries were not only interested in the technology alone but also in the costs involved. Continuing to the Smart Mobility Lab of the Competence-Center Automotive Services and Communication Technology (ASCT) the guests could now get active themselves, navigating a virtual highly modern car, by means of the steering wheel and the gas pedal, from the entrance of a park house right up to a charging station. The highlight: they saw – like the computer in the fully automated vehicle – no walls but the point reflections of the laser streams. 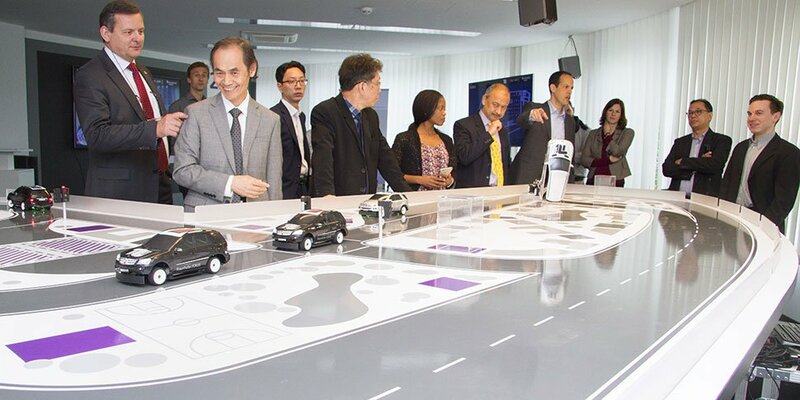 To conclude, scientists of ASCT demonstrated autonomous driving cars on the basis of a model. Fraunhofer FOKUS participated in a further Metropolitan Solutions event and received on the 21st of May guests within the “Safe City Solutions and Communication Technologies” excursion organized by the Berlin business development corporation Berlin-Partner in cooperation with the Deutsche Messe. The Metropolitan Solutions is a new conference exhibition of Deutsche Messe AG, which will take place in Berlin from 20 to 22 May 2015.